All the features specific to Kvarner can be found in the Kvarner “pot”: the abundance of the sea and coastline, the barrenness of the rocky ground and of the hinterland, the wildness of the mountain, and the tameness of the valley. Instead of recommending what to taste, let’s just say that fish, crabs and shells come from the clear sea, that vegetables and fruit grow on unpolluted soil and that lambs and game breathe fresh air. Healthy food is served here. In order to get a more complete idea of the natural alimentary wealth that gave the regional cuisine its origins, we must make a distinction between coastal and mountain cuisine, their differences being attributed to natural and geographical conditions. 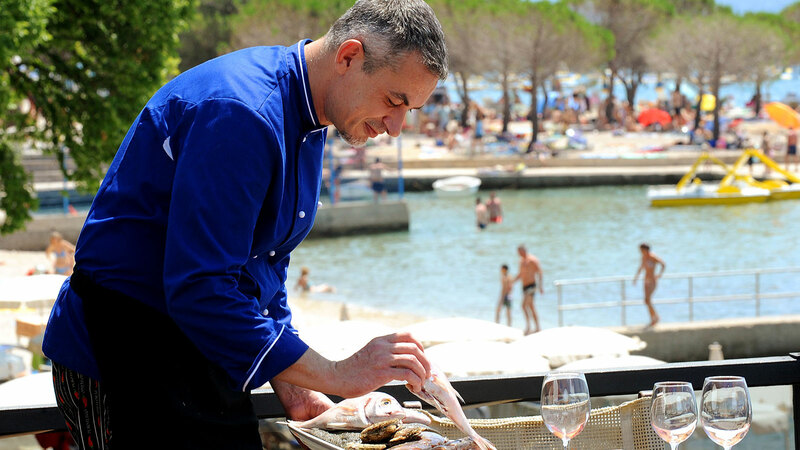 The seaside cuisine, owing to its Mediterranean and maritime influences is based on fish, shellfish and squid, on lamb, pasta, Mediterranean vegetables, fruit and herbs, on olives and olive oil, on chestnuts (“maruni”), and wine, while the mountain cuisine is based on game, milk and cheese, meat and mushrooms, frogs, snails, freshwater fish, vegetables – potatoes or cabbage in particular – wild fruits and spices, as well as on strong drinks, brandy, juniper brandy, and honey brandy). In addition to the distiction between coastal and mountain cuisine, different methods of food preparation are also found in the microregions themselves. Each island, even each village, has its own food preparation methods. While you are in Kvarner, in the littoral and mountain area, do not miss a taste of either the island or the mountain cheese (“škripavac”), the smoked ham (“pršut”), green or black olives, lamb (roasted, or cooked under a baking lid: “pod pekom”), octopus salad and the local “brodet” (fish stew), bear prawns and doormice, shellfish and octopus, batter-fried frogs, the well known “scampi”, grouper and venison, asparagus and mushrooms, the typical pasta “šurlice” and gnocchi, cherries and blueberries, chestnuts and wild strawberries, “povatice” and fritters (“fritule”). If you do not succeed in tasting everything this year, see you next year!